To provide supportive evidence of paranormal activity at this site. This is an “initial” general investigation. A further “specific” investigation may be warranted depending on initial findings and owners consent. The visitor centre is part of a converted farm outbuilding complex, which has been tastefully developed into a cafeteria area comprising seating areas at ground floor and a smaller gallery seating area above. Off the cafeteria is an impressive “farm shop” & souvenir area with substantial chillers/refrigeration areas. Toilets/washrooms and a small kitchen area are situated centrally between the farm shop and cafeteria. A paved courtyard with additional seating areas leads to the Visitor Centre Museum. This is a separate single storey building housing artefacts & replicas from the 1406 Shrewsbury battle, together with Historical literature on Henry 1V. Battlefield Church lies a short 2minute walk from the Visitor centre and is owned separately by the Churches Conservation Trust. A black hat with white feather was sensed! Several team members saw lighting anomalies. John pickled up a hayloft fire/ heat…killing a “migrant worker”. Mary seems to be more responsive to women. A strong sense of an Executioner (Axe man) was felt by one medium, who felt that the executioner was “measuring him up” i.e. how much force to use to behead him! A sense of being on a ship & swaying was mentioned (possibly reclaimed ship timber? Both staff members and some team members felt a sense of swaying, hot sweaty palms, and one of the staff members felt particularly emotional on hearing that the spirit Mary watched over the staff & meant no harm. The name Joshua was picked up…he wanted to show one medium his Grave. Note Martin’s new Video batteries flattened unexpectedly, preventing further video footage. Marie also required an unexpected battery change to her Voice recorder. At around midnight The Shop’s Cat kindly presented us with a beautiful dead mouse. No significant activity was indicated. An accident involving a stable lad and a violent death was picked up. This involved a short walk from visitor centre to Church via a turnip field. John felt the presence of a small group of “Airmen” (WW2 RAF types) who were following our group and approached from the North of the Field. Returning back from the church investigation at around 02:00am John, Kirsty & Neil were lagging behind and clearly heard a voice say “I’m over Here” (this was not the other group members. The church interior felt particularly cold but this was probably conducive to the plummeting outside temperature & drafts within the building. Shadows were seen in the main church area (where pews face each other) along the wrought Iron griddling areas. An unsavoury presence was sensed in the Vestry area. 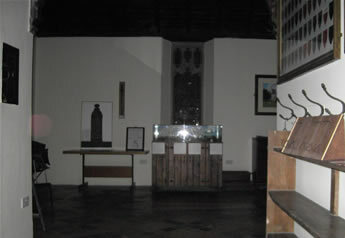 Both John & Neil could make out dark grey shadow movement in the unlit Vestry room. John also picked up on a Corbett male member…who brought possible shame on the family’s good name. It was also sensed that the church had held “Parties” or non-religious celebrations. Kirsty confirmed that this was true. Kirsty heard a baby crying in the Ladies Toilets. Updates will be added to this report as and when new information becomes available. Video footage has been analysed…and no additional persons were captured. Distorted faces of some team members appeared “normal” during analysis. 1786- Thomas Telford worked in Shrewsbury converting some of Shrewsbury Castle ruins into a house. 1792-Thomas Telford constructed his first Stone Bridge at Montford Bridge just outside Shrewsbury…He took his design inspiration from Battlefield Church Shrewsbury. EVP recordings have been checked/analysed. Faint singing/chanting can be heard on one recording…another recording has captured faint “panting” and shuffling/walking.